The OPEC surprised markets late Wednesday, announcing an agreement to limit oil output to 32.5-33 million bpd, setting a committee to discuss the details, with the final deal to be signed in the next formal meeting, scheduled for next November. Crude oil prices soared, fueling the positive mood around stocks, the Canadian dollar rose alongside with oil, while the Japanese yen fell sharply. 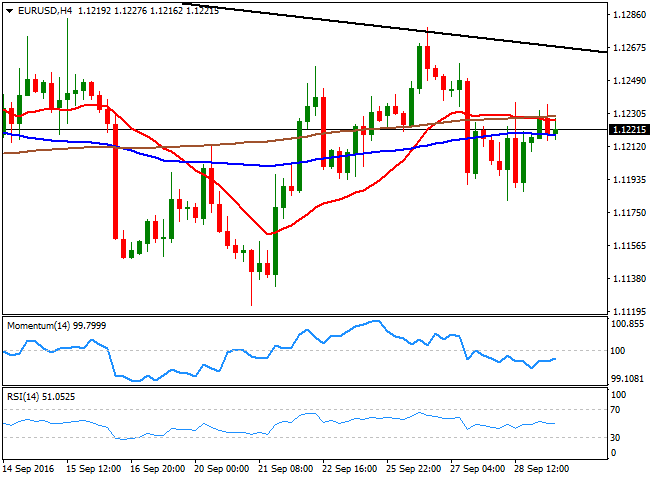 But the EUR/USD pair remains mute around 1.1200, with European majors unmotivated. Europe released so far German unemployment figures, showing that unemployment grew by 1,000 in September, resulting in an unchanged rate of 6.1%. The country will release its preliminary September inflation data later today, expected to remain flat for a second consecutive month. As for the US, the country will release the third reading of the Q2 GDP, expected unchanged at 2.3%, pending home sales and weekly unemployment claims figures, none of them expected to be a big shock. With Central Banks expected to maintain the status quo for longer, the market is still looking for a trigger to move the pair, and seems unlikely it will come from macroeconomic data scheduled for this week. The technical picture, according to the 4 hours chart is still flat, with technical indicators heading nowhere around their mid-lines and the price stuck around horizontal moving averages. The 1.1280 price zone is still the main resistance to surpass to confirm a leg higher towards 1.1335, whilst below 1.1200, the pair may decline towards the 1.1160 region, with a break lower exposing 1.1120 the base of these last few weeks' range.